In the depths of winter and longing for spring, I am finding reminders everywhere of how much our lives are consumed by waiting. In the hospital, patients wait to be examined, to be found competent to stand trial, not criminally responsible for the actions that led to their confinement, for the voices to stop, to be allowed to go home. Mothers wait for their babies to be born and people everywhere wait for the results of lab tests, CT scans, and biopsies that will unlock the mysteries of health and illness and give them a glimpse of the future. Every day, we wait for the alarm to ring, the water to boil, the bus to come, a friend to call or an absent loved one to come back into our lives. It seems as if we are always waiting for something or someone to supply a missing ingredient that will tell us what we need to know, get us where we need to be, or make us feel that we are fine just where we are. Given that so much of our lives involves waiting, we ought to know how to do it well. An internet search turns up a wealth of information about waiting for everything from the bus to come to biopsy results. 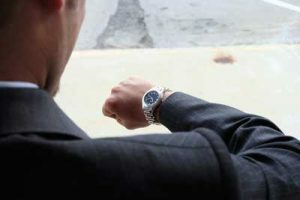 There is an enormous span in the importance of the things we wait for, and it seems only reasonable that tips for making waiting easier should take that hierarchy into consideration. produces a more tolerable waiting experience by eliminating the need to decide which line to enter. We have all known the frustration of getting into what we think is the shortest and/or fastest moving line only to find that another choice would have been better. Waiting for a bus is easier and the wait seems shorter when we have access to real time information about when the bus will arrive. This kind of information is now readily available in most urban areas with apps specifically designed to track the movement of public transportation vehicles. Restaurants too have mastered the art of manipulating the experience of waiting. When you check in at the desk, you get an estimate of your wait time, a menu to peruse so that your waiting feels productive, and an invitation to wait at the bar. There, the hope is that you will relax and spend some money on drinks that will help you forget what you are waiting for in the first place. Fast food establishments have a similar way of dividing waiting times into segments that use up the time and make it seem shorter. You order at one station and drive to another where you pay and receive your meal. Waiting in line or for public transportation or a meal at a restaurant or fast food drive-through are low-stakes waiting experiences. After all, what is a bus ride, a bag of groceries, or a meal compared to waiting for information about college admission, professional licensure, or important medical tests? Waiting for these high-stakes results brings us into a different realm of experience where the outcome can determine the course of our lives. While it is important to have efficient systems to deliver this kind of information, it may be even more important to cultivate the personal qualities and practice behaviors that can help us through these high-stakes waiting situations. Research reported by Kate Sweeny and Sara Andrews in the June 2014 issue of the Journal of Personality and Social Psychology showed that a combination of high tolerance for uncertainty, low need for closure, higher levels of dispositional optimism, and lower levels of defensive pessimism (expect the worst and never be disappointed) were associated with lower levels of anxiety and rumination in 50 subjects waiting four months for the results of the California bar examination. Anxiety levels spiked for all subjects on the day after the exam, decreased slightly six weeks later, only to gradually increase and spike again on the day before the results were delivered. So, while there appears to be no way to avoid the anxiety of waiting for potentially life-altering information, it may be possible to make our waiting more tolerable by distracting ourselves, avoiding rumination and practicing new ways of thinking about the situation. Optimism, or the expectation of a favorable outcome, may be hard to come by for those of us conditioned by experiences of loss and disappointment to expect the worst. Hope, which in combination with optimism makes an even more powerful deterrent against the anxiety of waiting, may be as hard to come by as it is to define. Is it the last evil to escape Pandora’s box, Emily Dickinson’s “thing with feathers” that sings sweetly in the soul, the conviction that we will be all right even when our optimism proves false, or something else? Positive psychology tells us that hope arises when we feel a sense of urgency and have a number of pathways to achieve our goals. Whatever hope may be, I’ll take it, for myself and all who wait – for the consultant’s opinion, the jury’s verdict, the doctor’s diagnosis, the baby’s birth, the phone to ring. As much as we try to live in the present and cherish the moment, we are, at the heart of things, the people who wait.